September 21, 2018, Zurich, Switzerland – When His Holiness the Dalai Lama met members of the media at his hotel in Zurich this morning Rudolf Högger, Vice President of the Board of Trustees of the Tibet Institute, Rikon, thanked him for coming. “It’s my duty,” His Holiness replied, “both my tutors were involved with Rikon Monastery, the first Tibetan Buddhist monastery in Europe. “Now, whenever I have the opportunity to talk to members of the media, I tell them about my main commitments. First of all, as I’m a human being, one of the 7 billion alive today, I try to share with others that our real source of joy is peace of mind. Secondly, for me as a Buddhist monk, the idea that our different religions are presently causing divisions that lead to people killing each other is unthinkable. Is it possible for different religions to live in harmony with one another? According to the Indian example, one thousand times, yes. Thirdly, as a Tibetan, I’m committed to keeping alive the ancient knowledge that Tibetans have preserved for more than a thousand years, as well as the Tibetan language in which it is expressed. In addition, I’m committed to encouraging the protection of Tibet’s fragile environment. “Look at my face; I was 16 when I lost my freedom, 24 when I lost my country. Since then news from Tibet has been distressing, but because I’ve trained my mind from childhood I’m able to keep my peace of mind. If you’re faced with a problem, analyse whether you can overcome it. If you can, that’s what you should do. If you can’t, worrying about it won’t help. Another journalist asked whether Aung San Suu Kyi has lived up to her responsibilities in Burma. His Holiness replied that since the problems first broke out he had met Aung San Suu Kyi and appealed to her to take action. She told him that it is complicated and that it’s difficult for outsiders to understand the role of military leaders. His Holiness was also able to explain that when people flee their homelands out of fear for their lives, we must give them shelter and support and help their children with education. When the situation improves they’re likely to want to return home to rebuild their countries. He cited the example of Tibetan refugees most of whom will wish to return to Tibet when they can, to take part in rebuilding and restoration there. 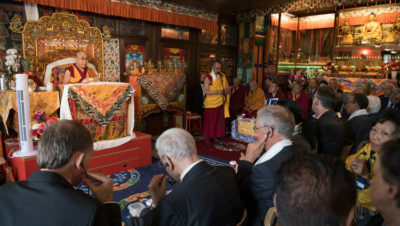 He described the Tibetan Institute’s importance in terms of preserving methods for tackling destructive emotions, cultivating positive attitudes and achieving peace of mind. Since this is his fifteenth visit, His Holiness was asked what he likes about Switzerland. From Zurich it was a twenty-five minute drive through the verdant Swiss countryside to the village of Rikon and the Tibet Institute. Joyful Tibetans, young and old, lined the road, eager to catch a glimpse of His Holiness. He greeted as many as he could and waved to others before walking down to the Institute where dancers and a traditional Tibetan welcome awaited him. He took part in a ceremony to inaugurate a new lamp house, before entering the Institute’s temple, saluting the principal image of the Buddha and taking his seat. The Chandzö led the chanting of prayers for His Holiness’s long life that included verses of refuge, the four immeasurable wishes, an invocation of the Buddha, offering verses, prayers to the sixteen Arhats and a mandala offering in the course of which statues of the three long-life deities were presented to His Holiness. This was followed by a recitation of the Prayer for His Holiness’s Long Life composed by his two tutors and an invocation of the sixteen Arhats once more with, ‘Through the blessing of this, May the Lama live long and the Dharma spread far and wide,” appended to each verse. Addressing the gathering, the Abbot of Rikon Monastery, Ven Thupten Legmon, welcomed representatives of the Swiss Government, His Holiness, sponsors and other guests. “We’ve completed the important ceremony of praying for His Holiness’s long life,” he said, “and we dedicate whatever merit we may have accumulated over the last 50 years to you for the benefit of all beings. As you have advised, we are giving young people an introduction to Buddhism, as well as teaching about love and compassion from a secular point of view. Dr Karma Dolma Lobsang, President of the Tibetan Institute Rikon (TIR), in her speech announced how happy the members of TIR were that His Holiness was able to come and join the 50th anniversary celebrations. She recalled that the two factory owners who had originally offered Tibetans employment, Henri and Jacques Kuhn, had asked what they could do to help preserve Tibetan culture and religion. That’s how the monastery came about. She also mentioned the Institute’s significant library and the steps that have been taken to make the Institute more of a centre of learning. “Fifty years seems like a long time in the context of our life in exile,” His Holiness declared. “To begin with it was the Red Cross who invited 1000 Tibetans to resettle in Switzerland and they were then the largest group of Tibetan refugees outside India. We didn’t think only of our own livelihood when we came into exile, we wanted to keep our culture and religion alive. However, I can remember watching monks building roads. We requested the Indian Government’s help in finding somewhere for monks to stay. “They provided the camp at Buxa, but we had to push to send 1500 monks there instead of the recommended 300. It was hot and humid, food easily went off and monks were exposed to TB against which they had little immunity. Eventually, however, they were able to shift to monasteries in the new settlements, where we now have Sakya, Kagyu, Geluk and Nyingma institutions. His Holiness referred to the old tradition of honouring the ‘Six Ornaments and Two Supremes’, great Indian Buddhist masters of the past. He realised that they were all a part of Nalanda University, but that the list was not exhaustive. It didn’t include several masters whose treatises are crucial to the Tibetan Buddhist course of study. 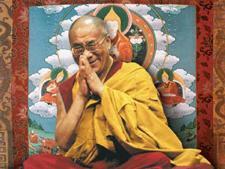 Consequently, he commissioned a new thangka painting and composed a Praise to the Seventeen Masters of Nalanda. Shantarakshita established Buddhism in Tibet in the 8th century, at the Tibetan Emperor’s invitation. What he brought was essentially the Nalanda Tradition, which is characterised by rigorous study of philosophy and psychology on the basis of reason and logic. We are deluded by attachment and anger, but we can learn to tackle these emotions. Anger can be reduced if we work to cultivate love and affection. However, we first have to come to terms with whatever benefits or disadvantages anger may bring. Primarily, anger destroys our peace of mind; loving-kindness earns us friends and eliminates the risk of being alone. Philip Hepp, Managing Director of TIR offered words of thanks. He thanked His Holiness for visiting the Tibet Institute for the fifteenth time, remarking that each time is an inspiration. His Holiness posed for photographs with the monks of the monastery and members of the TIR Board in the sunshine outside the Institute. They then gathered together inside once more to enjoy lunch together. Afterwards, as His Holiness walked out to his car to return to Zurich, several Tibetan mothers could be seen and heard urging babies and young children to look at him and catch his eye. He smiled and patted many of them on the head. Tomorrow, there will be further celebrations of the TIR anniversary at the Eulachhalle in Winterthur.